Grand Central Market’s darkest high-fructose secret, PBJ.LA has no line. Nestled between a taqueria and a staircase, the artisanal sandwich restaurant’s neon purple signage invites both nostalgia and an aggressive futurism. Behind glossed white counters, the long-time classic is given the increasingly popular “not your mother’s” treatment by a well-muscled man whose tattooed forearm scoops globs of peanut butter from a two-gallon cambro into a smaller one. “This place is about twists,” says the man operating the iPad POS system. In concept, PBJ.LA aims to transform what is old and a familiar into something new and exciting; it is an attempt (á la Viktor Shklovsky) to defamiliarize, to demand perceptual revitalization via a sort of culinary estrangement, ultimately, to affect the senses. Amidst the earthquake of sushirritos, glorified toasts, freakshakes, and rolled ice cream dishes that have dominated the foodie scene in the past few years, a re-envisioning of the peanut butter and jelly sandwich disrupts like a mere aftershock. Waiting for my order, I watch the first step of the sandwich-crafting process, which involves a mechanical press — invented by PBJ.LA — that removes bread crust and seals the slices’ spongy edges into a circular pocket with crimped edges, ensuring that the sandwich’s contents remain contained and intact. I am told that the sandwich sealer is yet another twist, reminiscent of sandwich preparation methods employed by mid-twentieth century American housewives, who shaped sandwiches and removed bread crust using overturned mason jars. The nod to 1950s domesticity feels more misguided than nostalgic, considering the restaurant’s ostensible Instagram-active target demographic. Upon receiving my food, there is an immediate and unmistakable physical similarity to the J.M. Smucker Company’s mass-produced Uncrustables. 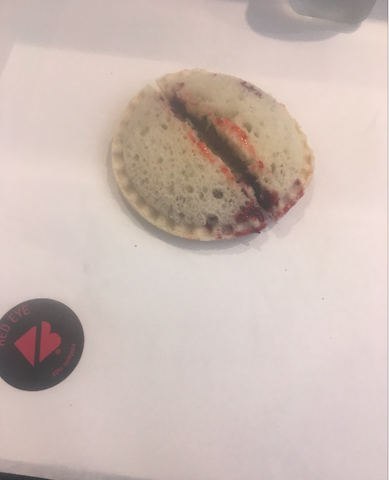 Lucky for PBJ.LA, the concept of a sealed-crustless sandwich as intellectual property, for now, lies tangled in the liminal space of patent-law controversy. First, I unwrap The New School. It is a structural nightmare. Strawberry jam oozes beyond the bounds of the bread as uncontrollably as former promises of intactness did from the restaurant employee’s mouth. I bring the heaping mess to my lips and breathe in. Chunks of nut-butter, jam, and bread disintegrate into a surprisingly uniform tactile experience best described as difficult. That said, the hand-made organic almond butter is great, but overpowered by the intrusive flavor of the strawberry jam. The bread disappoints. 5/10. Before continuing to my next sandwich, I take a sip of PBJ.LA’s signature, self-bottled reverse-osmosis H20. Unlike tap water (which is not offered), their water undergoes an in-house filtration process, later portioned into 4oz, stickered bottles, sold for $1. It is good. 8/10. Next up is The Red Eye. Unlike its predecessor, it is solid, approachable, contained, but not subdued. Flecks of ground espresso bean enhance the peanut butter’s expected flavor. Though, amidst this relative nut-butter bliss there remains an ominous familiarity between the hand-made dark chocolate raspberry jam and Smucker’s Red Raspberry Preserves, that cannot be ignored. I am sated, but unhappy. 6/10. The Italian is the worst. 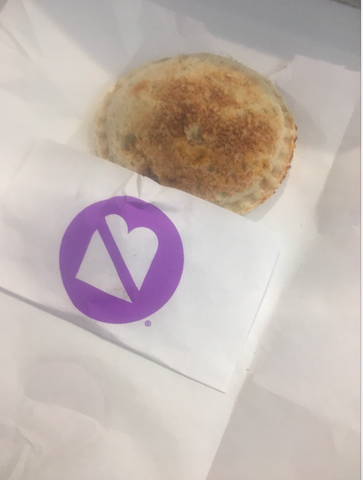 I take my first bite; it bears an undesignated savory flavor mutually shared with Lunchables, Hot Pockets, and Pop Tarts. I take a second bite and am certain that it should have been steel-pressed and crimped into non-existence. There is no nostalgia, no progression, no upending of the ennui of the familiar. 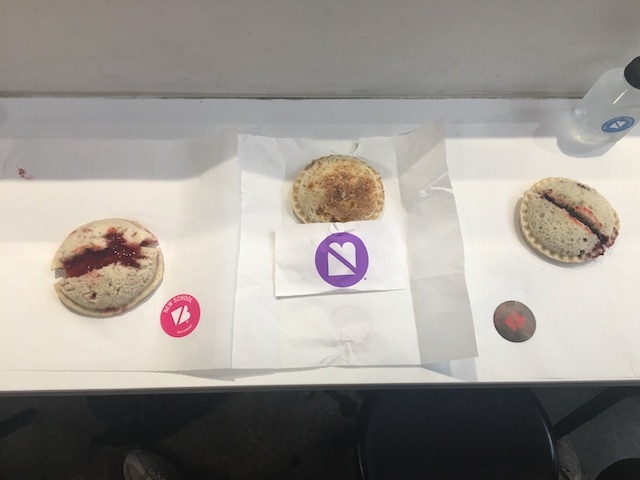 Picking at the jam residue on my hands beneath the fluorescent purple lights of PBJ.LA, I understand that here, there is only a void—a reminder of what never was, and what will never be. 3/10.